SAN MARCOS, CA — Culturally and spiritually, music has an impact on communities around the world. This new 69 minute documentary focuses on a Haitian family who helps their neighbors in a time of great distress and later, a young man gets a surprise visit from his hero, five-time GRAMMY Award-winner Victor Wooten. This basic human truth is celebrated in Haiti 10, an incredible story of faith, love, and music helping a community rise above the horrific 2010 earthquake that devastated the island nation. Now available for public viewing on YouTube, Haiti 10 will inspire new audiences with its positive message of hope and resilience. The magnitude 7.0 earthquake that struck Haiti on Jan. 12, 2010 left hundreds of thousands dead and more than 1 million homeless. While photojournalist Jon Moyer was visiting the country in September 2010 to help with recovery efforts, he met a pastor, his wife, and their 10 children, who were doing extraordinary things to help their community recover. With the support of their congregation, Pastor Pierre and his family committed to raising 20 orphaned or homeless children. 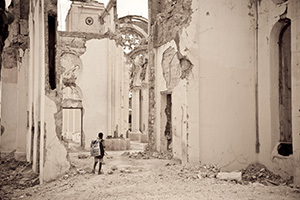 On a second visit to Haiti in 2011, Moyer learned that Pastor Pierre’s second eldest child, Bekenson Pierre, played bass guitar, but his instrument was damaged after the earthquake. Moyer, with colleague Pete Johnston, teamed up with music industry insider Josh Vittek to help give this aspiring musician the greatest surprise—a new instrument delivered by his musical hero, Victor Wooten. 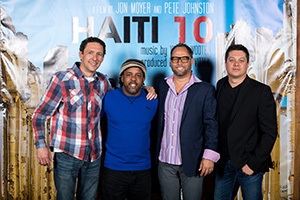 To watch Haiti 10, click here. Displaying 2017 06 20 Haiti10 Press Release r4 HTML.txt.